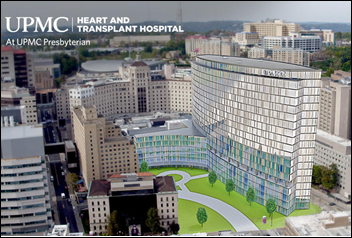 UPMC will spend $2 billion to build three new Pittsburgh specialty hospitals for heart and transplant, cancer, and vision restoration and rehabilitation. UPMC says it will reallocate existing beds to the new facilities. The Pittsburgh market has an excess of inpatient beds. UPMC declared itself as “the global destination for outstanding healthcare” in its announcement, in which it also states its aspiration to become “the Amazon of healthcare.” The 39-hospital, 80,000-employee UPMC also predicts it will double in size within five years. Its annual revenue is $17 billion. From Jingle Pockets: “Re: the JP Morgan Healthcare Investor Conference in January in SF. What are the best digital health parties?” I’ve never been invited or attended that conference since it’s for JP Morgan clients only as I understand it, so I can’t help. However, I’m sure some readers have been there and might offer suggestions. From Skilly Litigator: “Re: Citrix. Do you think most hospitals are aware of the software pieces-parts on which they rely daily or do they believe vendor claims that they wrote everything in-house? Do contracts require the big vendors to disclose the third parties whose solution their products require? Do customers ask for specific details about their rights as a sub-licensee? 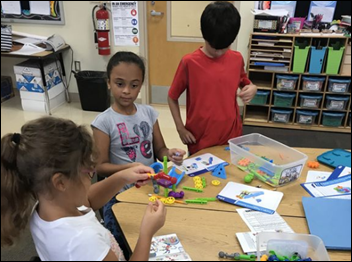 At least one vendor had their reliance on previously undisclosed third-party components disclosed in a lawsuit relating to sublicensing agreements. What happens if the parties go their separate ways or if a once-removed sublicensor retires their product?” Most clients would be aware of expensive third-party components like Citrix, Cache, or drug databases, but probably less so of free and possibly invisible components. Vendor developers use a lot of tools that could be sunsetted, while products that run on servers (web or otherwise) assume that the components they require will be around forever. Perhaps readers would be interested in a webinar on the topic – I’m open to suggestions. I don’t want to be an alarmist if few problems have cropped up related to third-party software components, but maybe it’s a bigger exposure than I assume. I haven’t received confirmation that Citrix hiked their license fees significantly as one hospital executive reported here previously. Poll respondents say GE Healthcare has taken the biggest ambulatory EHR fall, although the other vendors listed aren’t far behind. New poll to your right or here: Have you ever donated money to a hospital or health system without being pressured and without expecting a personal benefit? Those of us with health system management experience know that feeling of dread when the calendar invitation arrives for the upbeat meeting in which we will be collectively pressured to donate to hospital projects or to the United Way, with the clear but carefully unstated hint that our strong-armed magnanimity could affect the “team player” portion of our performance reviews. I would rather flush money down the toilet literally than to give it to hospitals to flush figuratively, but that’s just jaded and cynical me. An MD Anderson Cancer Center internal report warns that the organization will lose $450 million in FY17, with the cost of its Epic implementation named as one of the four contributing factors. McKesson lays off 60 employees of its Enterprise Information Solutions business. Walgreens files a $140 million lawsuit against former partner Theranos. Siemens announces that it will take its Healthineers division public. Hearst acquires Milliman Care Guidelines. Kaiser Permanente promotes President and COO Bernard Tyson to chairman and CEO, replacing George Halvorson. Allscripts CEO Glen Tullman confirms reports that the company is seeking strategic alternatives. CCHIT announces the first six inpatient EHRs to earn its permanent or conditional certification: CPSI, Eclipsys, Epic, HMS, Prognosis Health, and Siemens Soarian. A House bill supports independent health record trusts. Cerner says KU hospital let Kansas City down by choosing Epic, leading the hospital CIO to counter that it was happy to pay more for Epic than Cerner because its doctors like it a lot better. Cerner wins a nine-year contract to install PathNet in the VA.
Allscripts turns in decent quarterly results. Documents filed with the state of Georgia indicate that Athenahealth will close its Atlanta support center and lay off 61 employees the week before Christmas. Meditech announces a big quarterly product revenue jump even as earnings slid 31 percent. Cerner blames its quarterly revenue and earnings expectation shortfall on big deals that didn’t close and less-than-expected performance from its IT outsourcing business. The company says it is approaching $2 billion in annual revenue, making it the second-largest publicly traded pure health IT vendor. Allscripts will continue to support the former McKesson Star and HealthQuest revenue cycle solutions. The company confirmed that it cut headcount among the former McKesson employees almost immediately after the acquisition and did the same within the Allscripts group in Q3. It also shut down an Allscripts office in Atlanta in consolidating employees into the former McKesson office in Alpharetta. Allscripts plans to quickly integrate the former McKesson EIS into its operations, eliminating its separate identity within two quarters. The move of Horizon Clinicals into discontinued operations will be complete by Q1 of next year. As McKesson had previously announced, Horizon support will end in March 2018, although the company suggests that outside companies may provide some level of customer support. The company says it has not yet obtained customer feedback on McKesson’s laboratory information system but is interested in doing that. Allscripts plans to GA its new, cloud-based ambulatory EHR next year, touting its strengths as usability, interoperability, mobility, and inclusion of embedded AI tools. 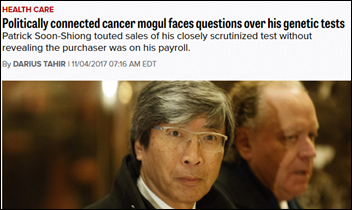 Politico reports that Patrick Soon-Shiong publicly bragged to investors about sales of NantHealth’s GPS Cancer genetic test to hospitals without telling them that some of the ordering doctors are or were on his payroll as consultants. Medical second opinion vendor More Health hires Jeffrey Lasker, MD, MMM (Vision Healthcare Consulting) as chief physician officer. Heather Haugen, PhD, MS (Xerox) joins Atos as chief science officer. Press Ganey hires Jason Erdell (Change Healthcare) as president and chief client officer. 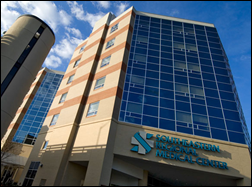 Southeastern Health (NC) will go live on Epic this month under its shared services agreement with Carolinas HealthCare. A former compliance team member of Epic customer WakeMed (NC) files a whistleblower False Claims Act lawsuit claiming that Epic defaults its software to bill both anesthesia base units and procure time in surgical cases, resulting in double billing that totals hundreds of millions of dollars across all Epic clients. Epic says the whistle-blower apparently doesn’t understand how claims software works and notes that the Department of Justice has already declined to get involved. 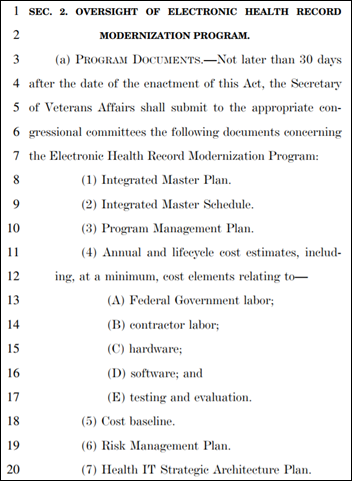 Four members of Congress who serve on the House Committee on Veterans Affairs introduce legislation that would compel VA Secretary David Shulkin to provide the committee with documents covering timelines and costs of its planned Cerner implementation. New FDA guidance tells medical device vendors that it’s OK to share the information that those devices collect directly with the patients using them with seeking additional FDA marketing approval, as long as those manufacturers provide no further interpretation than they already offer to physicians. FDA also acknowledges that some devices don’t collect information in a patient-friendly or shareable format and suggests that manufacturers tell patients to contact their doctors with any questions. 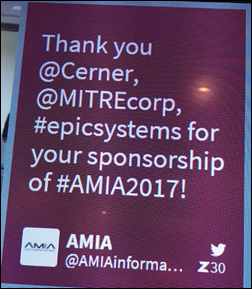 Craig Joseph, MD notes the awkward signage required to tout Epic as an AMIA 2017 sponsor despite the absence of a company Twitter account. Drug overdose deaths jumped 21 percent last year, a bigger increase than that of the previous four years combined. Gun-related deaths also took a turn upward from 9,600 to 11,000, with two-thirds of the total involving suicide. The biggest killers – cancer and heart disease – are on the decline, although drugs and guns more than offset those as the death rate actually increased. 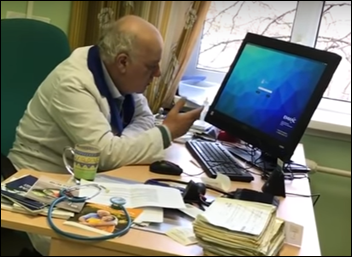 An apparently intoxicated cardiologist in Russia takes sick leave after being captured on video rambling incoherently and trying unsuccessfully to enter his computer password. QuadraMed, a Harris Healthcare company, will exhibit at HealthAchieve November 6-7 in Toronto. Salesforce will host its annual Dreamforce conference November 6-9 in San Francisco. Surescripts will exhibit at the 2017 NextGen One User Group Meeting November 5-9 in Las Vegas. 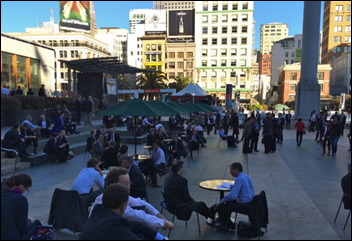 Huron will exhibit at Salesforce’s Dreamforce event November 6-9 in San Francisco. Kaiser Permanente: “Reorg” in informatics and IT. Lots of layoffs allegedly. Not sure if only corporate, but significant enough. Any news? As long as we allow Non-Profits in healthcare to act exactly like their for profit kin, we are never going to get healthcare spending under control in the country. I guess that you need to continue to expand to justify the 4 million dollar salary. How about a 2 billion dollar investment in rural healthcare for Western Pennsylvania instead of a glitzy destination showcase program? Any chance UPMC replaces Cerner with Epic for inpatient clinicals anytime soon? It looks like they have a lot of capital burning a hole in their pockets. They use Epic for ambulatory and Cerner for inpatient, it’s a pain point for their end users. I would be curious to hear readers’ opinions on the epic billing lawsuit. Is it true that this refers to professional billing only? To what extent is the billing the liability of a hospital versus the anesthesiologist? 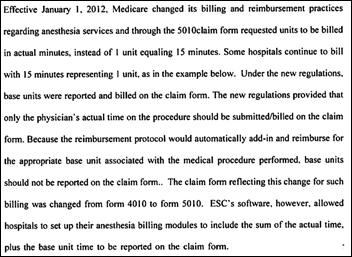 When CMS switched to actual minutes in 2012 were there other payers still requiring the units method of billing? I am surely missing something, but if there were different billing methods as a function of payer then the provider ( or their software surrogate ) would need to bill in both methods and then the billing office would need to pull out the correct method during the claims process, correct? I suppose that there should be some sort of decision support in place claims creation that defaults to minute billing for Medicare patients? Also: Why would Medicare pay both? And if you are uninsured/self-pay – then how does it bill? So many questions – I’m fascinated. I think the way it works is you can fill out two sets of related fields and CMS pays the lesser of the two (per the CMS guidelines). Not sure what other payors do.